Massive Savings! Bulk discount price! Only £5.71 (ex.VAT) per 25kg bag! This half pallet of x21 25kg bags of white rock salt will be delivered on a tail lift vehicle (with pallet truck), therefore no unloading equipment is required at the delivery address. White rock salt is clean to use, leaving no dirty residue to be trodden into carpets in buildings and vehicles. After a winter season there is no residue to sweep up and no drains to be cleared. Our white rock salt meets BS 3247 which is the British standard for de-icing salt. Our white rock salt is carefully screened to produce the most effective spread pattern increasing pedestrian safety and the working life of spreading equipment. The salt is harvested from sustainable sources around the Mediterranean Sea. Orders of up to 48 bags will be made using a vehicle with a tail lift and a pallet truck required for a kerbside delivery. 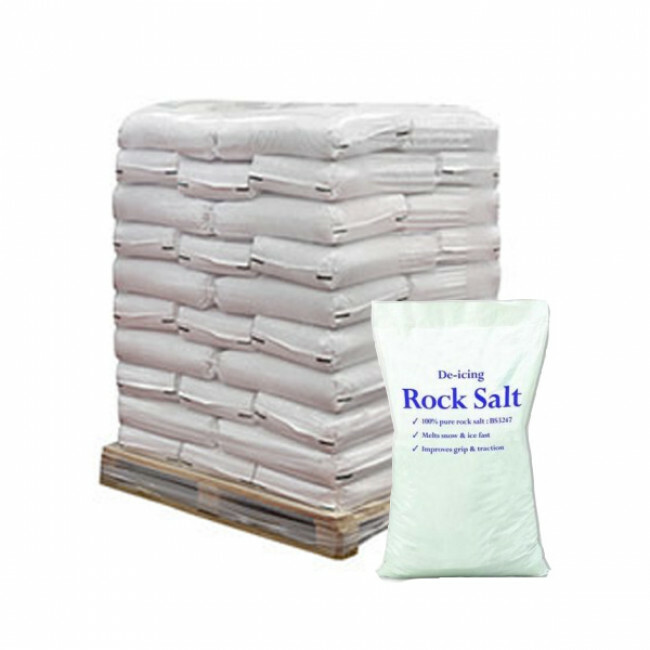 Orders for 49 or more bags of salt will require a fork lift truck to unload the salt from the delivery vehicle.